It's no secret that I'm currently living in an absolute tip of a house due to all of the work we...well - the Hubby...is doing in preparation for the new baby's arrival. But I'm managing with it because I know that in a few days all will be OK and then I get to work my magic, making everything all pretty again and just how I want it. It's these decorating bits that I love, when I can add all the cute things into the rooms, making everything feel all homely and warm. I'm in my element with it. So when I was approached by Morgan's property lettings agency with a little bit of a style up challenge, well, I couldn't wait to get started. Morgan's are a Leeds based company, helping people find their ideal type of city home. With summer fast approaching Morgan's were keen for ideas which would show their tenants different ways in which they could jazz up their apartments' balcony space - possibly the only private, outside space they have - making it a really stylish extension of their home. Naturally such a space is a very important part of any home and having it look as fab as possible nice is essential, so with a virtual £150 budget I jumped straight to the challenge. I searched a variety of high street stores for roughly ten items which could be used to transform the area into a cheery, welcoming, guest friendly space. Now being a Mum, my son always, always comes first and now with another kiddie on the way, for me, anything I would ever design would have to be totally child friendly. My balcony concept therefore had to be bright, slightly colour-clashy with lots of fun little touches, such as a cute wind-chime, some brightly coloured flower pots (to encourage the children's green-fingers to develop) and a jazzy wind-break/sun shield to not only protect the little ones but to also really brighten up the area too. 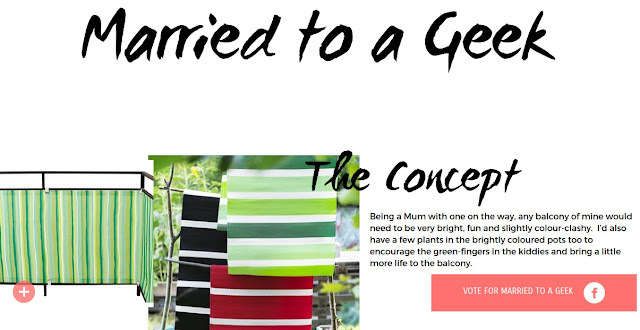 Not only can you take a peek at my idea but there's also a chance for you to vote for my design too as I'm in a little competition with two other blogger ladies. I won't lie, I would really love to win so please, please, pretty-please could you pop on over and vote for me and my little design...? Awww - go on - head over - there's two weeks to vote (until 4pm Wednesday 10th June) and as I said, I would really, really, really love to win.